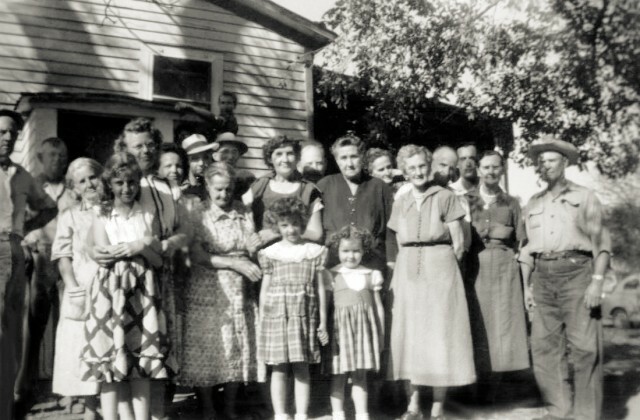 This photo of a family gathering, supplied by Nancy Benton, is of an event which would have occurred before 1939 as Delana Fowler Brewer is shown and she died November 4, 1939 at Oscaloosa in Dade County, Missouri. The first photo is the original. Just wanted to show that because I needed to mock up a lower part of the photo in order to not cut out the gentleman on the left. Below, to add some definition, I did a quick color job, nothing detailed as the photo is too lo-fi. Now for identifications supplied by Nancy Benton. The third man over in the back row (with the hat) is Charles Bryant, b. 1890, husband of Pansy Ruth Noyes. In front of him is Delana Fowler Brewer, b. 1854, the matriarch of this clan photo. The woman behind the smallest girl is Edith Gilmore Brewer b. abt. 1894, wife of Robert Walter Brewer, b. 1890, a son of Delana’s. Next to her is Bettie Brewer Noyes, daughter of Delana, b. 1877. Between and behind them is Pansy Noyes Bryant, b. 1895. The man next to Pansy (looking over Bettie’s left shoulder) is Walter Brewer and Jessie Brewer Jones, another daughter of Delana’s, b. 1888, is to the right of Bettie. I think the man on the far right would be Levy Jones, b. 1883, husband of Jessie Brewer Jones. 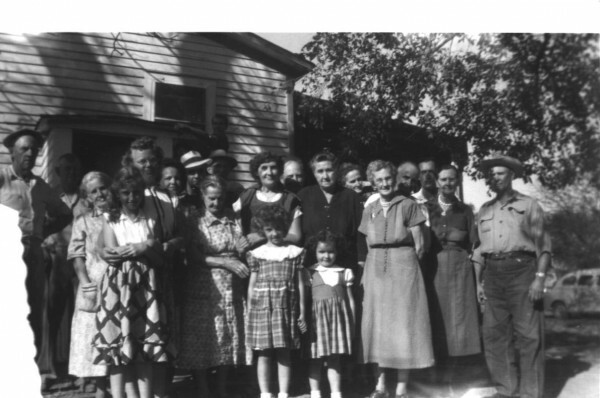 All the individuals to our left of Delana are unidentified, as is the woman with the curly dark hair standing to the right of Delana. The two girls in front are unidentified. The man standing hidden behind the two women in the middle of the photo is unidentified. The young man limbing the house is unidentified, as is the young man behind Jessie Brewer Jones. The Spurlings are Mary Katherine Brewer Spurling, b. 1872, another daughter of Delana’s. She married three times, to a George Spurling, and they had a son named Earl, and also to a man named Rhodes (this was before 1939) and a Robert L. Trent. I don’t know the order of the marriages. 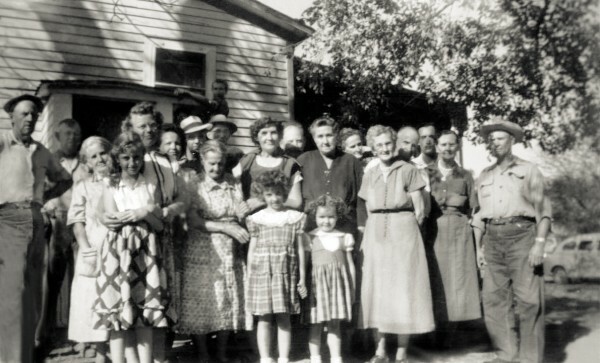 If Mary Katherine Brewer Spurling is in the photo, she is in her 60s and is either going to be the woman on the far left or the woman standing to the right of Delana (just left of center of the photo). Dorothy Noyes McKenney (a daughter of Bettie Brewer Noyes) and her husband, Lloyd, aren’t in the photo. Also, Ray Noyes, husband of Bettie Brewer Noyes, wasn’t identified by Nancy Benton as being in the photo. The reunion was perhaps to honor Delana, who died at the age of 85 in 1939. I don’t know the location of the photo but it is likely in Dade county, Missouri. 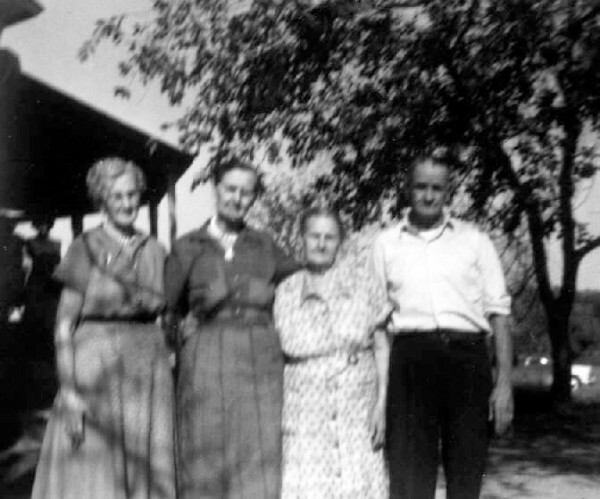 Another photo from the same gathering shows Bettie Brewer Noyes, sister Jessie Brewer Jones, their mother Delana, and an unknown individual. I imagine it is one of Delana’s sons, possibly Robert Walter who is seen in the family group picture as well but his face is obscured in the second row.